Posted May 4, 2010 6:43 am & filed under Questions, Reader Photos. I really enjoy your blog. Really getting into succulents now. Went to a garage sale a few weeks ago and bought this cactus . Could it be a rat tail?? Or an Aporophyllum?? 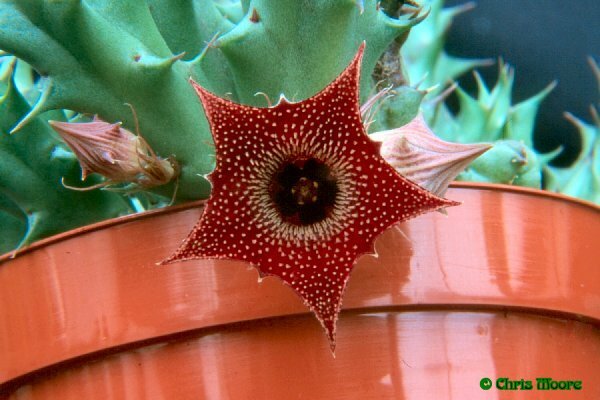 It turns out your plant isn’t a cactus at all, but a stapeliad (in the asclepiad family) and the species is Huernia macrocarpa, also known as the dragon flower. Check out the cute as a button carrion flower here.